The star of the blue hills! 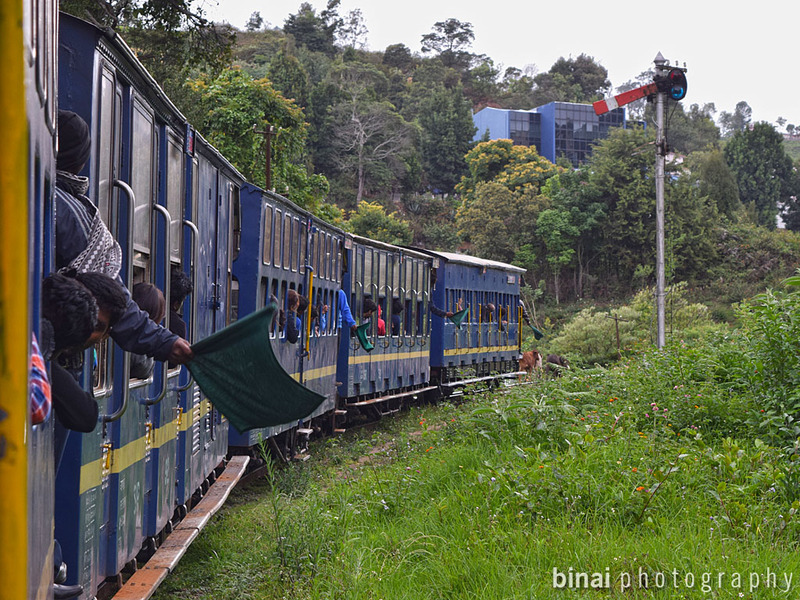 The Nilgiri Mountain Railways! 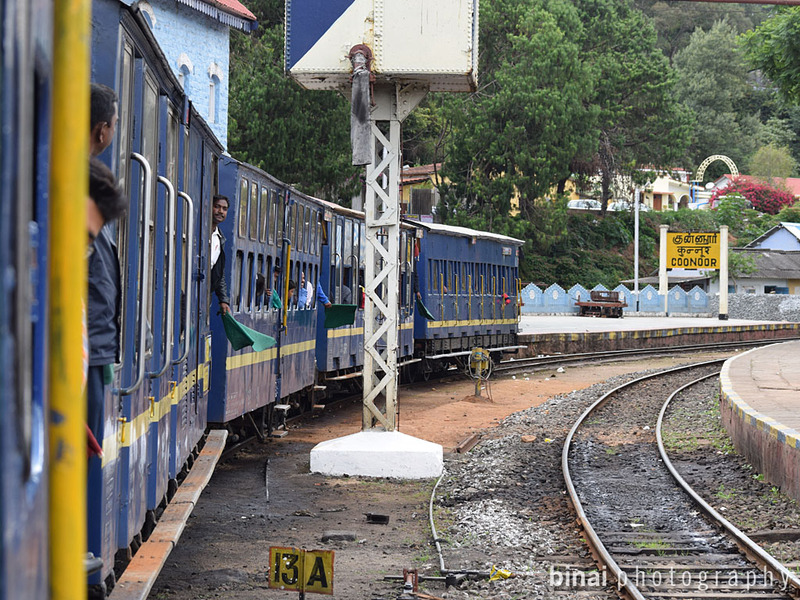 The Nilgiri Mountain Railways is, perhaps, the sole surviving metre-gauge railway line in India. India once had a large network of metre-gauge lines - but, probably, only this 46km line now survives. 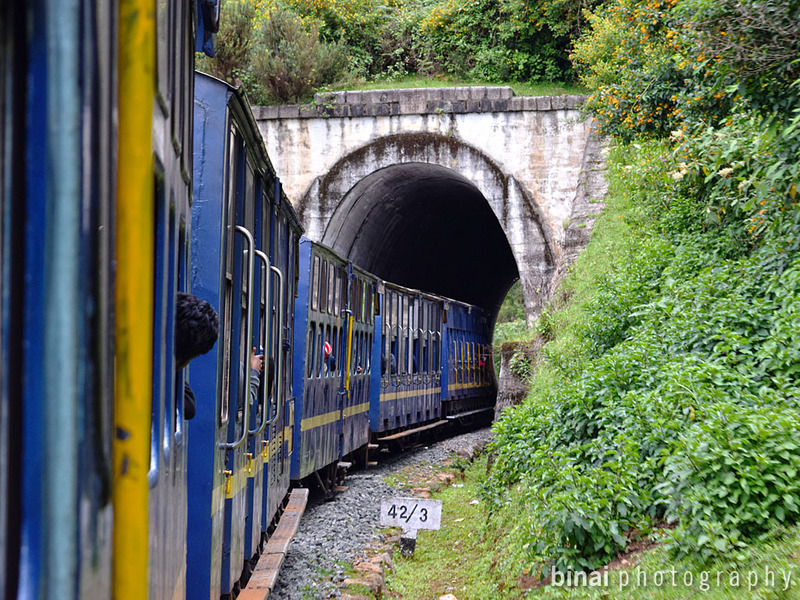 Nilgiri Mountain Railway (NMR) is famous for more than this trivial reason - it is also a UNESCO Heritage site. The origin of the NMR dates back to 1908. It was originally laid by the British, and is now under the Salem Division of Southern Railway. 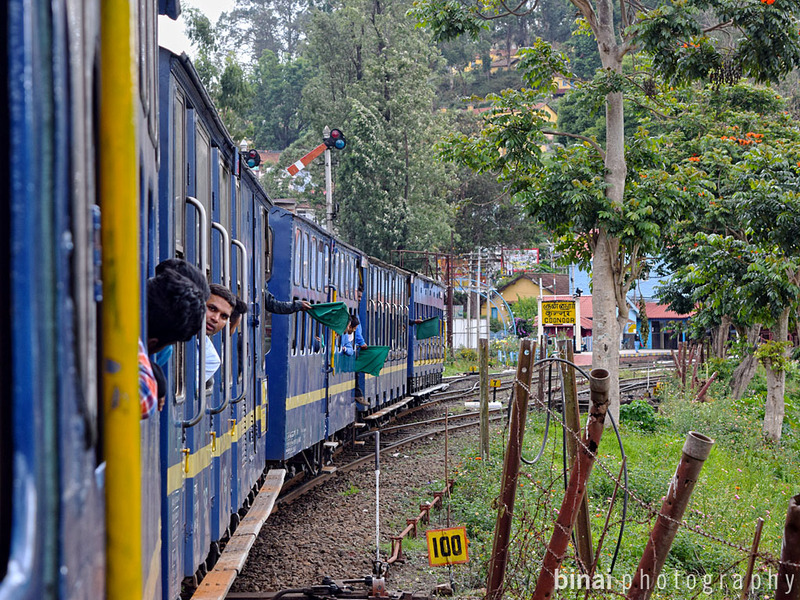 NMR is also famous for being the sole section with regular scheduled steam powered trains. I had last traveled in this section back in 2011 (read here). Back then, I couldn't enjoy much of the Coonoor-Ooty ride. I was in Ooty recently for a six-day long training program. On the closing day of the program, I and another participant who was at the venue decided to have a quick ride on the NMR. We initially thought of traveling from Ooty to Coonoor, but later reversed the stretch and decided to ride up the hills from Coonoor to Ooty. We hurried out of the venue sometime around 1430hrs. Luckily, we got an auto soon after we came out of the venue, which dropped us at the Ooty bus station some 5 minutes later. 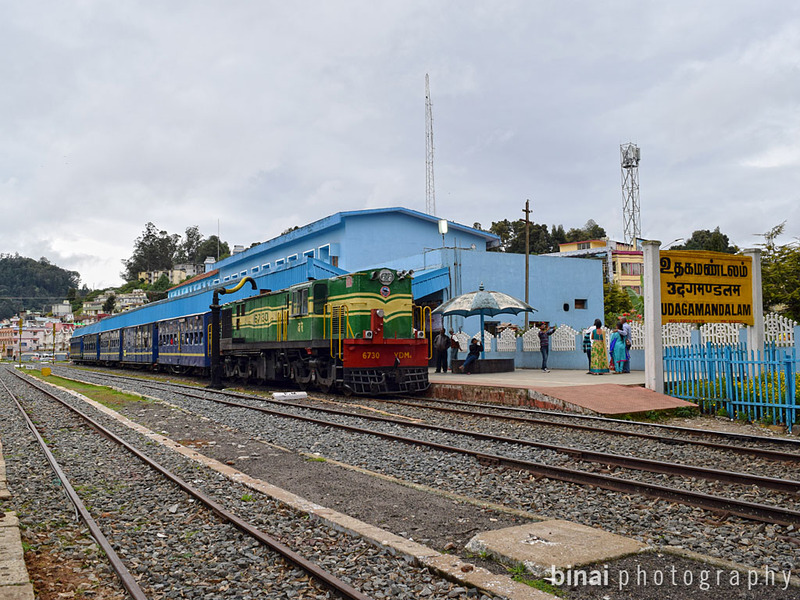 We had to be in Coonoor before 1600 to comfortably make it to the 56138 Coonoor-Udhagamandalam Passenger, than leaves at 1630hrs. We decided not to take an ordinary bus, but looked for a long distance bus, which could take us to Coonoor faster. We got a bus heading to Tiruppur - the conductor first didn't entertain us, but called us in as the bus started from the bus station. We were dropped at Coonoor by around 1550hrs. We rushed to the railway station to get our tickets. 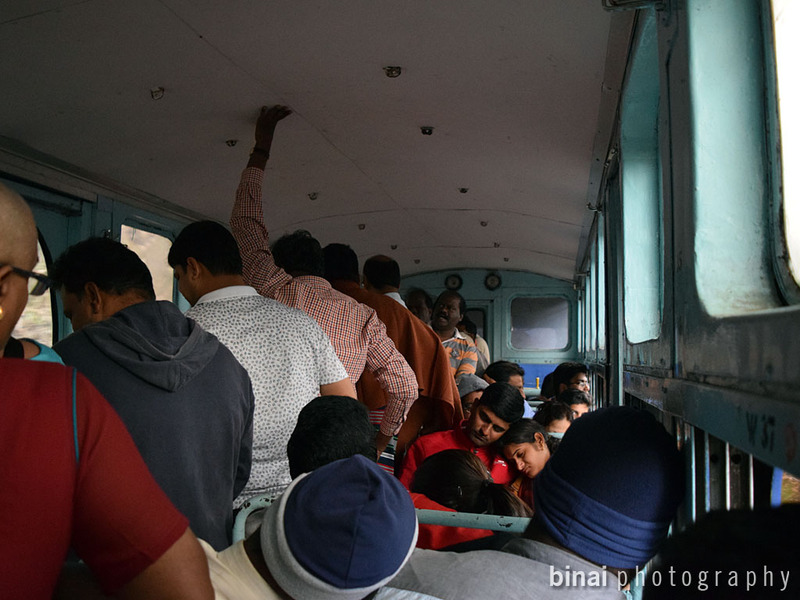 A notice at the ticket counter announced that only 140 tickets will be sold - Each coach had seating for about 57 passengers. 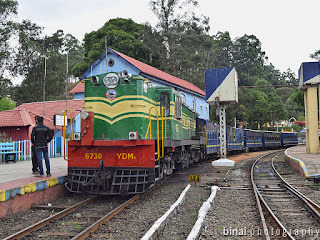 YDM4 #6730 with the rake.. @Coonoor.. The LP doing pre-departure checks.. The 56138 Udhagamandalam passenger had 5 coaches - including two-and-a-half unreserved second class sitting coaches, one-and-a-half reserved second class sitting and a half first class sitting coaches. 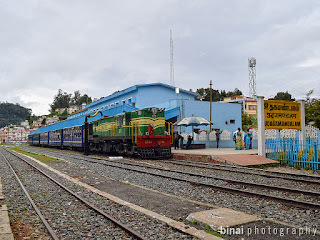 A YDM4 (#6730) of Ponmalai (Golden Rock) Diesel Locomotive Shed was to work the consist up the hills. The loco was shut down at that time. 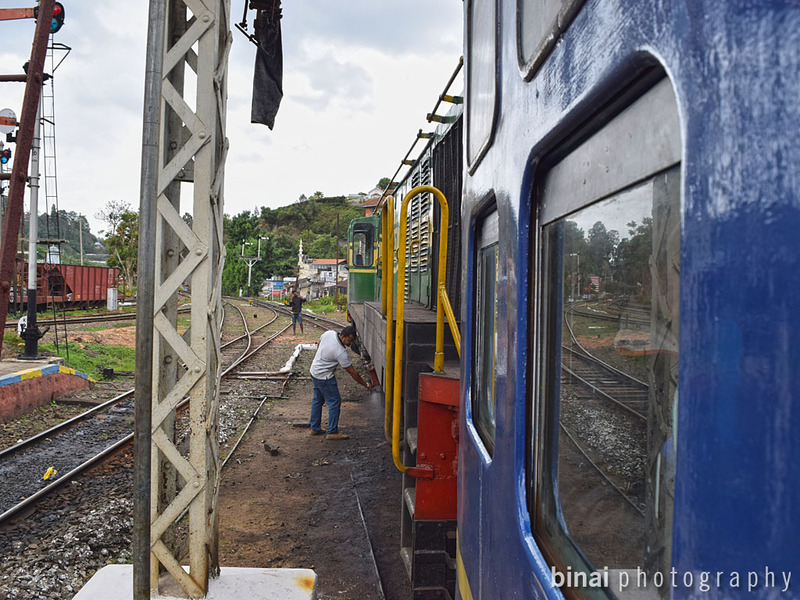 The loco pilots came around at 1615hrs and turned on the engine. The familiar phur phur sounds from the loco began. The LPs were seen doing pre-departure checks on the engine. A bell was rung at 1625 announcing that the train would depart shortly, and one more at 1630hrs, followed by a series of whistles and green flags being waved by brakesmen in each coach. A long horn from the loco, and we slowly powered forward. 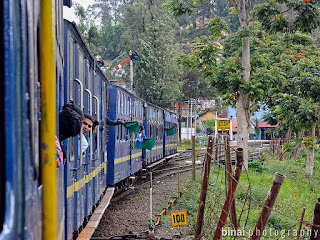 Based on my previous experience, I knew that the engine would be at the rear when the train heads to Ooty (Udhagamandalam) - Me and my friend selected seats based on this direction of movement, while majority of the passengers guessed the direction wrong and selected seats facing the engine. The train slowly crawled out of the station and moved towards Mettupalayam for some time. 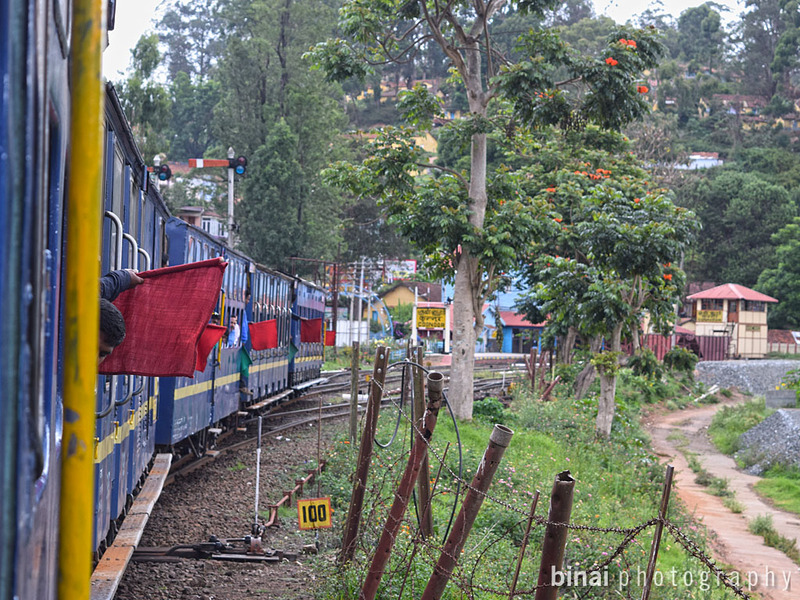 Soon all the brakesmen waved a red flag - a rarity on Indian Railways, and the train came to a complete halt. We stopped for a couple of minutes. Soon the semaphore lifted , the guard at the, now leading end, blew a long whistle, all the brakesmen waved the green flag, the loco blew a long horn and began pushing the train forward. 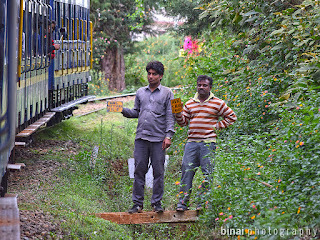 The train makes a very sharp climb out of Coonoor, with a gradient of 1 in 27. Soon after the climb is a left curve and then the section more or less levels out. 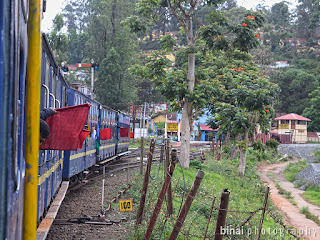 The rare scene.. Red flags..
As the semaphore raises, the flags go green and we move forward.. 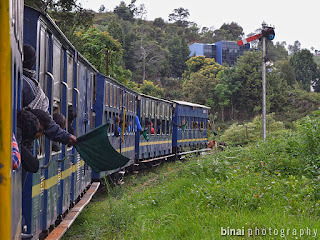 The sharp climb out of Coonoor..
A little after we climbed up, the train came to a complete halt. I initially thought it could be some technical halt - but the loco honked a lot. It was not the usual emergency chain pull signal. A little later I understood what was the scene - cattle were blocking the permanent way! There was continuous honking from the loco for sometime. We slowly inched forward at the speed of the cattle, which was moving along the tracks. After a lot of attempts by the crew, the cattle moved off the track and we picked up speed. Speed - I am not talking of great speeds - we moved in the range of about 25-30kmph. There were some gradients around, and a total of three tunnels - all of them around 400~500m long. The first halt was at Wellington. My coach got fully crowded here - atleast 10-12 standing passengers in addition to 57 seated passengers. The section generally passes through sparsely inhabited areas - the tracks were lined on both sides with eucalyptus plantations. The valley got visible on the left side in some places. The smell of eucalyptus gave company through the journey. The air was chilling and my fingers got numb often. I did not note down the timings at each station. 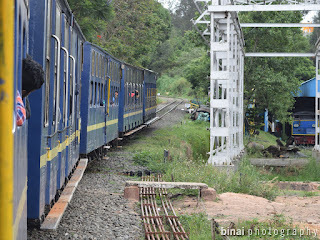 There were 4 stops, excluding the origin and destination, on the route - Wellington, Aravankadu, Ketti and Lovedale. Except Lovedale, the other stations were on the left side. There were some areas where I really wished I was on the ground than the train - lovely photogenic curves with awesome picturesque locales! From the looks of it, majority of the passengers were tourists who were travelling just to experience the train. The locals seem to prefer buses! One of the three tunnels en route.. I saw a token exchange at Lovedale - but since the train moves are extremely slow speeds, and the train halts there, the token exchange was nothing spectacular. The train stopped, the pointsman handed over the token and collected the old token. A highway ran parallel to the tracks after Lovedale, and a lot of vehicle drivers stopped to see the train - feels very good. There is one ghost station - more of a halt station - at Fernhill. The train fully slowed, honked and picked pace again. We pulled into Udhagamandalam a little before the scheduled time. People jostled to get off the train so that they could click selfies with the train. The coach has only one exit, which is terribly narrow as well. There is another door, that opens to the platform outside the coach, which is used by the brakesman. They used this door as well to let passengers out. While I did not click selfies, but I did spend some time clicking the train. This was another awesome trip on the NMR. The last time, I slept through this section (Coonoor to Udhagamandalam) - so this trip was an awesome chance to experience the section fully. The seats in this coach was terrible - hardly any legroom, and the seats were narrow. The seats were good for this 1 hour ride, but certainly not for a longer ride to Mettupalayam. That is not a deal breaker - you are becoming part of a heritage ride anyways! 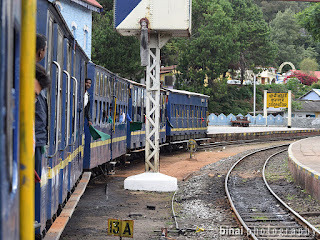 The ticket counter at Coonoor issued the normal computer printed tickets using the Unreserved ticketing system - the good ol' Edmundson tickets would have helped keep the heritage feel. 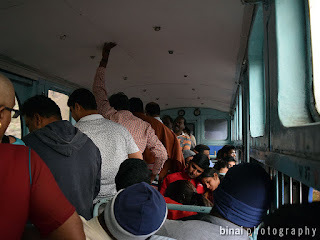 Another railway journey that I enjoyed - and perhaps the sole metreguage and steam section that the future generations in India would witness [I did not travel in the steam section as part of this journey]. The Sagararani - Kochi's own sunset "cruise"